Seishun Gakuen Middle School 3rd Year – Class 1 – Seat 12 Primary School: Seiharudai Daiichi Elementary School Birthdate: October 7 Zodiac: Libra Best Subject: World History Worst Subject: None Position in Club: Captain Committee: Student Council President Favorite Place to Visit at School: library Relatives: Father- Tezuka Kuniharu; Mother- Tezuka Ayana; Grandfather- Tezuka Kunikazu Play Style: All-rounder Dominant Hand: Left Special Moves: Zero Shiki Drop Shot, Tezuka Zone Height: 179cm Blood Type: O Favorite Shoes: Mizuno (Wave Dual Lite <6KW93009> ) Favorite Racket: Mizuno (Pro Light S90) Signature Techniques: Drop Shot, Zero Shiki Drop Shot, Muga no Kyouchi, Hyaku Ren Jitoku no Kiwami, Saikikanpatsu no Kiwami. Tezuka Zone, Tezuka Phantom, Zero Shiki Serve Favorite Subject: World History Favorite Color: Blue and Green Favorite Food: Grilled eel with special sauce over it Hobby: Mountain climbing, fishing, camping Spends Allowance On: book fees Favorite Quote: "Yudan sezu ni ikou" (Don't let your guard down.) Favorite Foods: unacha Favorite Movies: famous classics regardless of whether they're Japanese or foreign Favorite Book: western books Favorite Music: classical (Beethoven) Favorite Date Spot: Fishing in the streams on a mountain Most Desired Item: A photo book of famous mountains in the world Daily Routine: writing in his journal Things he doesn’t like: neglecting one's work Other Special Skills: woodwork Father's Occupation: Office worker (Trading) (Grandfather's a policeman and knows taekwondo) Seiyuu: Okiayu Ryoutarou Kunimitsu Tezuka (手塚 国光, Tezuka Kunimitsu?) is the captain of Seishun Academy's ("Seigaku" for short) tennis team, Tezuka is considered to be a National-level tennis player. As the captain, he is very serious, and is strict when enforcing order within his team. Tezuka is the character who encourages the series' protagonist, Ryoma Echizen, to develop his own style of tennis, leading the latter to consider him to be both a mentor and a rival. Throughout the series, Tezuka constantly struggles with the pain in his left arm, which was caused by an injury inflicted upon him by an upperclassman two years prior. However, he is often willing to sacrifice his arm in order to defeat his opponent and lead his team to the Nationals. 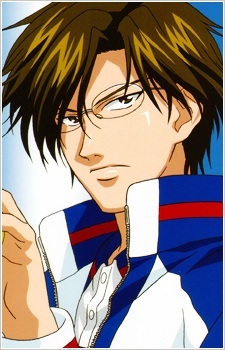 Background Kunimitsu Tezuka is introduced as the serious and strict third year captain of Seishun Academy's tennis club, who gives Ryoma Echizen a chance to become a regular by allowing him to participate in the Intraschool Rankings Tournament. Despite being known as Seigaku's "strongest man", he initially remains on the sidelines during tournaments, as another teammate would sometimes play in his usual position of singles 1 or his team usually defeats their opponents in straight sets. Though he secretly challenges and defeats Ryoma in an unofficial match in an attempt to reach his junior to become Seigaku's new "pillar of support", his true skills are first shown during an Intraschool Ranking match against Inui. Three years prior to the start of the story, a young Tezuka showed up after the Junior Tennis Tournament and easily beat the tournament's runner-up, Genichiro Sanada. The tournament champion, Seiichi Yukimura, challenged Tezuka to a match, but the winner is not revealed. After entering Seishun Academy, Tezuka was seen as overconfident and arrogant by the upperclassmen at Seigaku due to his talents and seriousness, especially when they discovered that he was left-handed even though he played with his right. A jealous teammate then injured Tezuka's left arm, leading to chronic problems, and his sealing of Hyaku Ren Jitoku no Kiwami, a technique which required the use of his left arm. Still, because of his skills, he was recognized by captain Yudai Yamato, who convinced Tezuka, who had decided to leave the club because he did not want to be on the same team as people who hurt others with their racquets, to become Seigaku's "pillar of support". This, along with the promise he made with teammate Shuichiro Oishi, in which Tezuka promised to lead Seigaku to the Nationals, encouraged him to stay in the tennis club. Shusuke Fuji later requested a match against Tezuka, and though Tezuka was defeated, Fuji was displeased with the outcome after finding out about Tezuka's injury. The two promise to play each other once again after Tezuka's arm completely heals. After a while, Tezuka became a team regular despite being a freshman. By his second year, he became the team's vice-captain, and defeated Hyotei Academy's captain in the Tokyo Prefectural Tournament. He was invited to the Junior Senbatsu tennis training camp, but because his arm problems returned, he declined the invitation without stating his reasons to the organization. The first serious official tournament match he plays is against Hyotei's captain, Keigo Atobe. Though the return of Tezuka's arm injury causes him to collapse in pain, he refuses to give up, and after a long and tedious tie-break, the game ends with Atobe victorious, marking Tezuka's first loss in an official singles match. Tezuka then decides to go to Kyushu in order to receive medical treatment for his injuries at a health clinic near Seishun University. While Tezuka overcomes his fear of feeling the pain in his shoulder, he continues to support his team, sometimes discussing the team's lineup for upcoming matches over the phone. In the anime, Tezuka recovers at a renown sports clinic in Germany at Ryuzaki Sumire's recommendation. He plays one last match against Ryoma before he leaves, using is right hand for the whole match. Tezuka takes time to adapt his Tezuka Zone for his right hand and finishes Ryoma off with a right-handed Zero-Shiki Drop Shot, challenging Ryoma to adapt to a player who can evolve during the match. He returns right before the National Tournament, where he unseals his Hyaku Ren Jitoku no Kiwami, to defeat Higa Middle School's captain, Eishiro Kite. Tezuka goes on to defeat Hyotei's Munehiro Kabaji. In the National semi-finals, despite it being a doubles match, Tezuka plays one-on-one against Shitenhoji's Senri Chitose; their partners step aside in order for them to play with their full power. After unveiling his new Zero-Shiki Serve, as well as revealing that he has opened Saiki Kanpatsu no Kiwami, Tezuka wins. Before the final match of tournament against Rikkai Junior High School, Tezuka tells Oishi that he plans to go to Germany in order to become a professional tennis player after this tournament. During his match against Genichiro Sanada, Tezuka unveils his Tezuka Phantom, however, this, combined with the continuous use of the Zero-Shiki Serve, damages Tezuka's arm, creating a weakness which Sanada soon uses to his advantage. A cord ball by Tezuka which drops from the net to his side, results in Sanada's victory. However, in the end, after Ryoma's win against Rikkai's captain Seiichi Yukimura, Tezuka finally achieves his goal of turning Seishun Academy into the National champions, and smiles for the first time. Some time later, Tezuka, along with the rest of the Seigaku regulars as well as several other middle schoolers, were invited to the Under-17 Training Camp, where he, along with his fellow middle schoolers, were placed in a tie-breaker style elimination match that the middle schoolers thought of pairing up for doubles. Tezuka paired up with his protege, Kaido Kaoru, and tried to convey him the message of being the next captain of Seigaku, and defeated him 7-0.